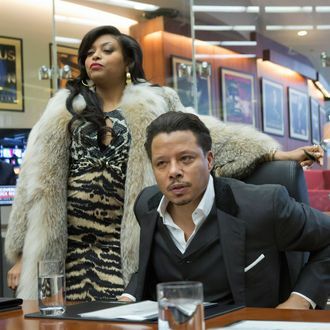 It takes a special kind of person to look at the success of shows like Empire, black-ish, and Fresh Off the Boat as something to fear, but that’s just what Deadline did last night, in a story that asked, “Ethnic Castings — About Time, or Too Much of Good Thing?” As the site’s TV editor Nellie Andreeva argued, the industry’s recent shift toward more diverse casting, which has generally been regarded as a long-overdue step in the right direction, is actually unfair to white actors, who have found themselves passed over for quality roles this pilot season. As expected, Twitter treated Andreeva’s post with the appropriate amount of scorn, as showrunners, actors, critics, and viewers all stepped up to express their displeasure with her prose. Reductionist hacks in entertainment journalism: about time or too much of a good thing? Don't think of that Deadline article as one person's opinion, but the collective opinion of a bunch of Hollywood agents. Feel better? All that Deadline article was missing was "I'm not racist but..." as its opening sentence. I swear, people are intentionally writing anger-bait articles for #BlackTwitter now. #Deadline.